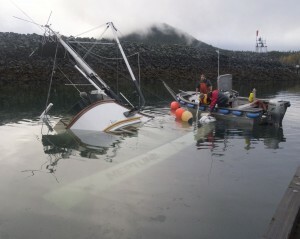 Fuel from a sunken vessel in the Haines Small Boat Harbor has been contained, although it could still be several days until clean-up is complete and the boat is salvaged. The 76-foot fishing tender Neptune sank while moored at the harbor about 1 a.m. Saturday. No one was onboard, but someone in the harbor called 911 and Harbormaster Phil Benner was notified. Benner said he and his staff responded and found the engine room flooded and the back deck already underwater. Benner said the harbor staff deployed containment booms at the harbor’s entrance within 45 minutes. He contacted the boat’s owner who said there is about 1,600 gallons of fuel on board. Early Saturday morning Benner shut the harbor to boat traffic to keep leaking fuel from spreading into Port Chilkoot. “Everybody’s moving as fast as we can but we want to make sure we aren’t contaminating Lynn Canal by opening up the harbor,” he said. A sheen was visible in harbor early Saturday. The smell of diesel permeated the area, which is only a few blocks from downtown Haines. As the tide receded, a black line of diesel was left on the rock break wall and along grassy areas of the beach. Local diver Norm Hughes went to the harbor early Saturday to see the sunken tender. Then the boat’s owner, Don Axelrod, called Hughes to see if he would dive on the boat. As a commercial fisherman, Hughes was especially interested in helping out. Officials with the Coast Guard and field responder Bob Mattson with the Alaska Department of Environmental Conversation arrived by mid-day Saturday. As soon as the Coast Guard approved an operating agreement, local responders from the Southeast Alaska Petroleum Resource Organization, or SEAPRO mobilized. SEAPRO is the area’s oil spill removal organization. It has response teams in seven zones of Southeast, including one with equipment based in the Haines Harbor, which, Mattson says, helped with quick response time. Mattson said officials decided to allow fishing boats to leave the harbor, but a decontamination site was set up at the harbor’s entrance. Beginning Sunday morning, fishing boats were stopped at the entrance and sprayed down. “We have them come over here to our decontamination station and we’re using pressure washers to try to get as much of the film or sheen off the vessels prior to letting them leave the harbor,” Coast Guard Petty Officer Joshua Thorne said. After the fleet left, the cleanup effort began in earnest. At least 15 responders were walking the docks in the harbor and using small skiffs to lay out absorbent oil pads. Mattson said because of the size of the harbor, and difficulty maneuvering around the sunken vessel, the skimming skiffs were not being used. The Neptune is a privately owned tender contracted by Ocean Beauty Seafood during the commercial fishing season. Axelrod, the owner, and his insurance company are working on a plan to raise the Neptune. Axelrod was on the docks Sunday and talking with a salvage company, but didn’t want to comment. Coast Guard petty officer Jeff Cruz said Sunday the salvage operation is going to be difficult. The Neptune is a wooden hull boat, built in 1937. Cruz said wood hull boats are difficult to raise. Mattson and the Coast Guard says they have not discovered any wildlife affected by the fuel spill at this time. The Coast Guard will investigate the cause of the sinking.